When visitors come to New York, one of the first places they go is Times Square and its bright lights. From its neon billboards to glitzy theatre ads, Times Square has been separately referred to as the world’s crossroads, center and heart. And what could be better than to declare your love right at the center of the world!? 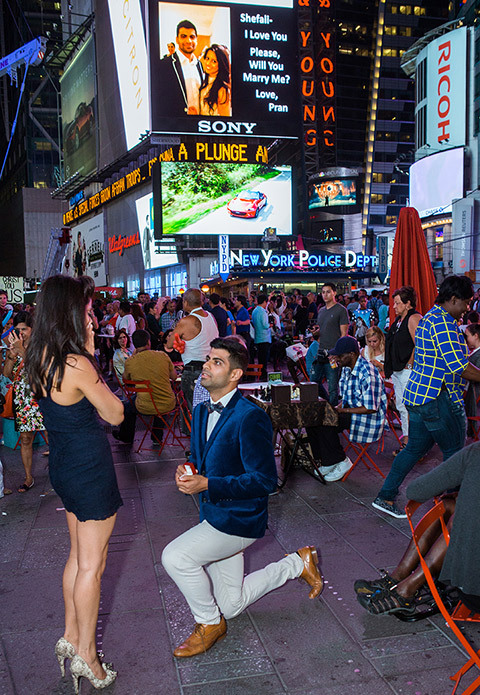 Times Square proposal ideas are strictly for those who want to proclaim their love to the world — and to do it in style! We beam your photo onto on a Times Square billboard, together with the magic words “will you marry me? 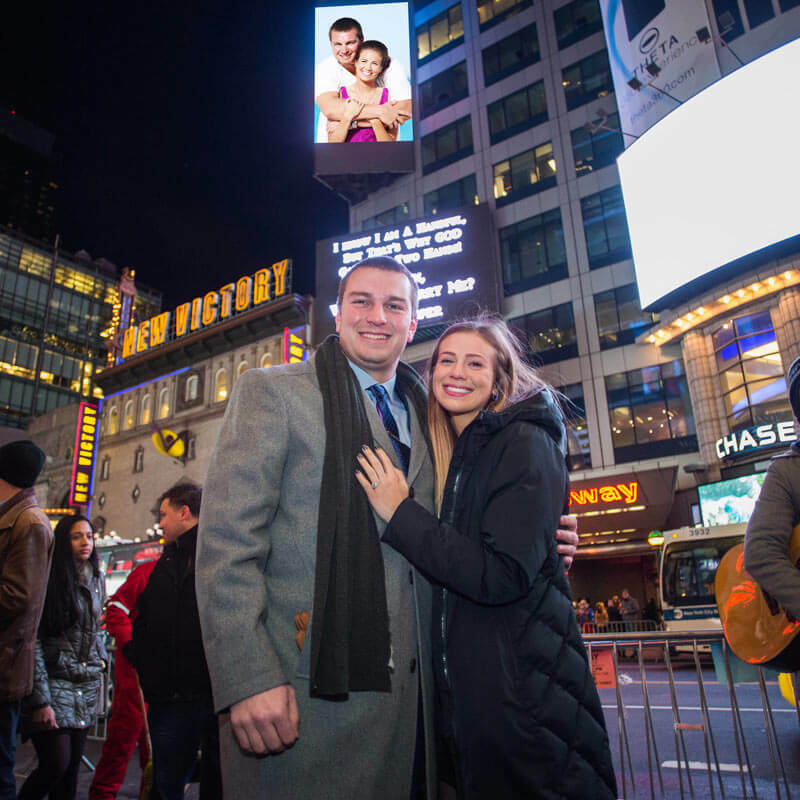 Big screen engagement proposals are one way to pull off a huge surprise; it’s not for the shy violets! But for those of you who crave a bit of time in the spotlight, this is the perfect proposal idea. Statements don’t come much bolder than this. Another benefit of a Times Square billboard proposal is that the area offers much in way of distraction; you can invite your partner there under the pretence of seeing a Broadway show or eating out. You might then casually pass by a screen and stop to take some photos. That’s when you can really surprise them — right in the middle of the Square! 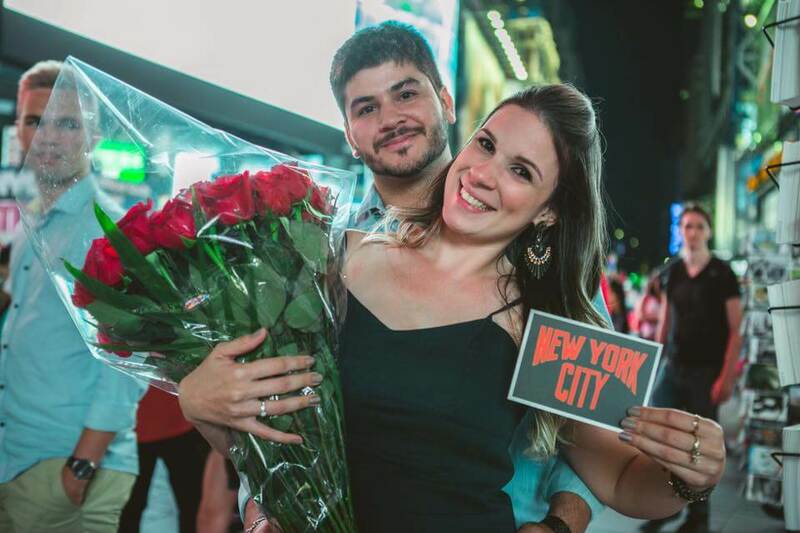 Take a look at our special Times Square Billboard Proposal package, that comes with the 5 minute Big Screen air time and 50 red roses. That will be a great surprise for her and trust us it worth it. Make sure you have our experience photographer to capture this moment. That is why we are also offering a Times Square Billboard proposal with photography package. In this case you will have 5 minute Billboard airtime proposal and gifted photographer, who will capture this wonderful moment. 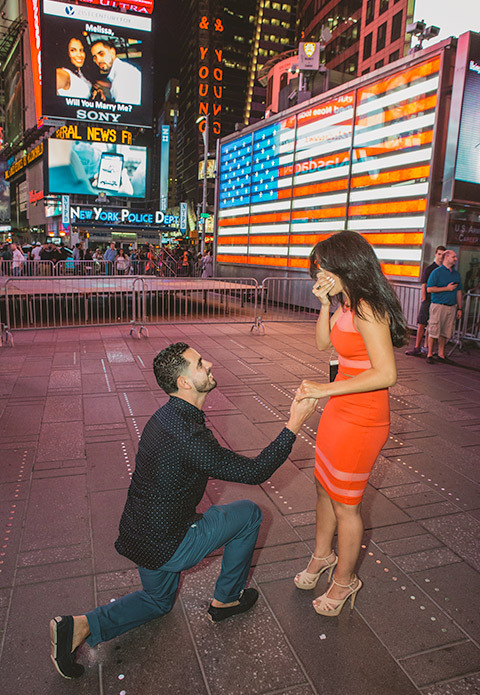 Our photographer knows the exact place and position from where the pictures will look its best during the proposal, plus after the proposal photo session in Times Square. If you want more, we are also offering Times Square proposal with photo and video package. Here you will get an amazing pictures plus the full video of your proposal, edited on the song of your choice. Proposal 007 was created by the gifted photographer Vlad Leto and creative event planner Tatiana Caicedo, this is the best combination you can ask for your proposal. We come up with the unique and original idea for your proposal and capture it on camera in the best way possible. You’ll love this day so much that you won’t want it to end, and with a secret photographer or videographer to capture the moment, you’ll be able to live it again and again, keeping the beautiful memories with you forever. Book your romantic proposal NOW! !